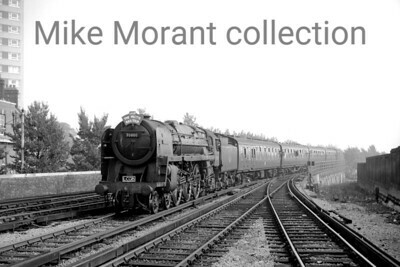 Not much to explain here as we all know what Standard pacifics are: Clans (6MT), Britannias (7MT) and the solitary Duke (8P). 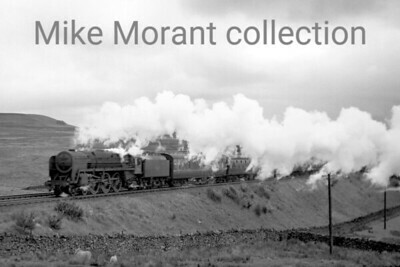 There will be shots of the Brits that were used to conduct the Westinghouse brake tests and we also see a Clan on the Western Region as well as several Britannias on the Southern's metals. I'm always on the qui vive for more material to augment this part of my collection. Please contact me via the Add comment button at the bottom of the image page if you have anything available. 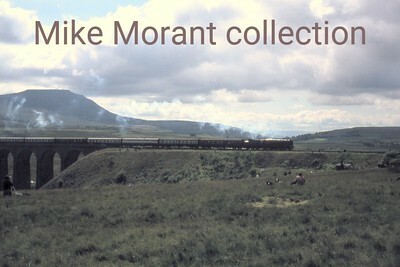 LCGB: The Vectis Rail Tour 4/10/64 BR Standard 7MT No. 70000 Britannia passes Eastleigh en route for Portsmouth Harbour station in this less than sharp image. 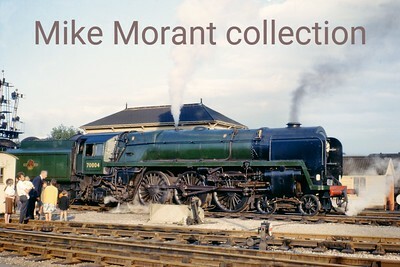 The prototype BR Standard pacific No. 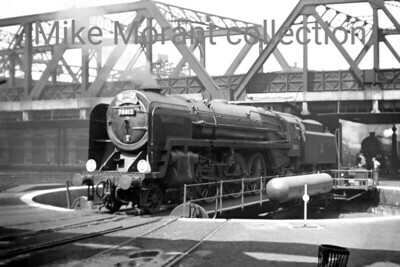 70000 Britannia sporting the Hook Continental headboard at Stratford mpd. 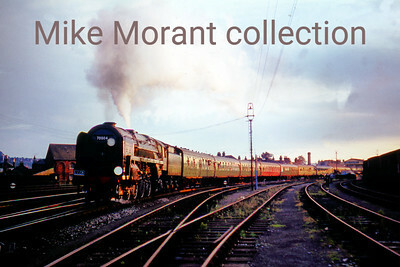 LCGB: The Vectis Rail Tour 4/10/64 BR Standard 7MT No. 70000 Britannia enters Portsmouth Harbour station having travelled from Waterloo via Reading, Basingstoke and Fareham. 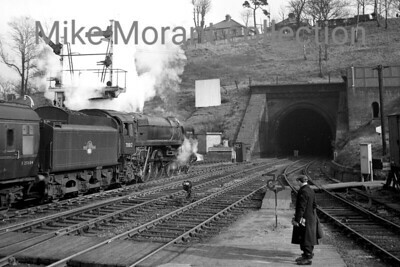 LCGB: The Vectis Rail Tour 4/10/64 BR Standard 7MT No. 70000 Britannia rests at Portsmouth Harbour station having travelled from Waterloo via Reading, Basingstoke and Fareham. 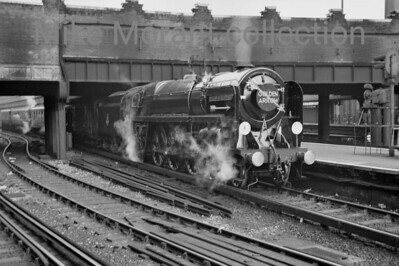 RCTS: Great Eastern Commemorative Steam tour 31/3/62 Sparkling BR Standard 7MT 'Britannia' pcific no. 70003 John Bunyan prepares to depart with the final leg of this tour from Thetford with Liverpool Street as the destination. BR Standard 7MT No. 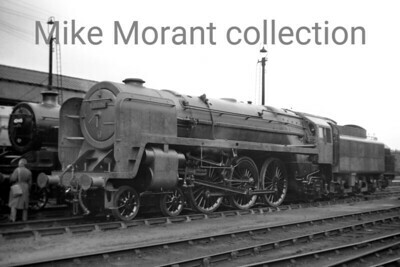 70005 John Milton is depicted here brand new and yet to received its top coat of paint at Crewe works on 1/4/51. BR Standard 7MT No. 70012 John of Gaunt was one of the 30A (Stratford) allocated batch and is depicted here adorned with the Broadsman headeboard on the cramped turntable at Liverpool Street station on 29/6/53. BR Standard 7MT No. 70012 John of Gaunt was one of the 30A (Stratford) allocated batch and is depicted here as a somewhat distant view passing Trowse Junction south of Norwich with a London bound express on 30/5/54. SLS: Carlisle Kingmoor Tour 15/10/67 Some railtours, whatever the motive power, were minimally photographed as seems to be the case with this out-and-back tour which originated and ended in Brimingham with WCML 25Kv electric motive power. BR Standard 7MT pacific no. 70013 Oliver Cromwell with its famed DIY nameplates took care of the rest of the day's proceeding from Crewe via the Settle & Carlisle route to Carlisle's Kingmoor depot which is where this shot was taken. 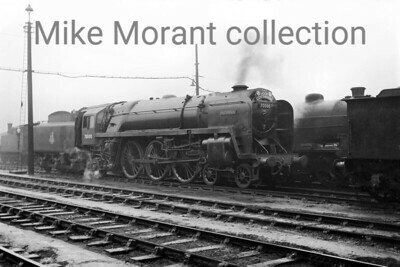 British Rail: Fifteen Guinea Special 11/8/68 BR Standard 'Britannia' 7MT pacific no. 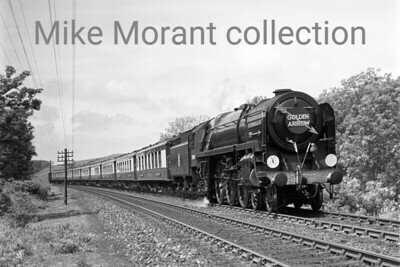 70013 Oliver Cromwell passing through Gisburn. 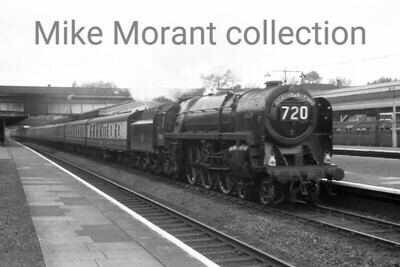 British Rail: Fifteen Guinea Special 11/8/68 BR Standard 'Britannia' 7MT pacific no. 70013 Oliver Cromwell at Ribblehead. BR Standard 7MT No. 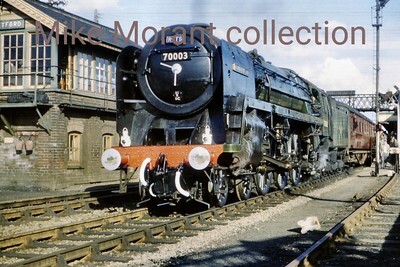 70014 Iron Duke in an undated view at Bournemouth Central. 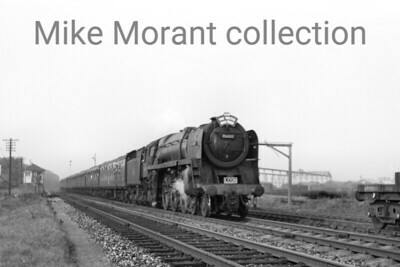 It's well known that 70014 was 'the other' Britannia allocated to Stewarts Lane in the 1950's but it's often forgotten that it was initially allocated to Nine Elms from June to October 1951 before moving down the road to 73A. BR Standard 7MT pacific no. 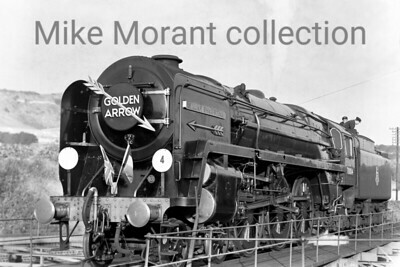 70004 William Shakespeare in charge of the Golden Arrow Pullman boat train as it passes Polhill signal box.